Kicking off "Stop Cyber Spying Week"
The ACLU, along with several other groups, is launching a weeklong campaign called "Stop Cyber Spying Week" to draw attention to the massive civil liberties problems in H.R. 3523, the Cyber Intelligence Sharing and Protection Act of 2011, better known as CISPA. CISPA is scheduled to be voted on by the House of Representatives next week. Every day, we all spend more and more of our lives online and share more and more of our most sensitive information. Keeping our computer systems secure is a real concern, but CISPA is absolutely the wrong answer. The bill would create a loophole in all existing privacy laws, allowing companies to share Internet users' data with the National Security Agency, part of the Department of Defense, and the biggest spy agency in the world — without any legal oversight. If CISPA passes, companies like Google and Facebook could pass your online communications to the military, just by claiming they were motivated by "cybersecurity purposes." CISPA would give the companies immunity from lawsuits if you want to challenge what they are doing. Once the government has the information, the bill allows them to use it for any legal purpose other than regulation, not just for stopping cybersecurity threats. We're joining the Center for Democracy and Technology (CDT), The Constitution Project, Demand Progress, Electronic Frontier Foundation (EFF), Engine Advocacy, Fight for the Future, Free Press, Reporters Without Borders, Techdirt, TechFreedom and others to make sure the House hears our concerns about CISPA and other cybersecurity bills ahead of the its proclaimed "Cybersecurity Week" next week. So the government wants our information. Let's give it to them. Tweet a message to your member of Congress on Twitter about the kind of things you do online that are none of the government business. Tell your Congressperson the details of what you do online—the personal, the mundane, whatever—so they can see just how much personal, unnecessary data about you could be shared with the government as a result of the legislation's dangerously vague language. Use the hashtags #CongressTMI and #CISPA. You can find your Rep's Twitter handle here. • . @MyReprsentative, I get lab and test results from my Dr online. Please don't give the govt access too! #CongressTMI Stop #CISPA"
This week we'll also be sending letters to Capitol Hill, talking to the media and keeping you all informed as the week progresses. Tomorrow, our very own Legislative Counsel Michelle Richardson will be briefing House staff and reporters, along with the Constitution Project and CDT, on our objections to CISPA and other bills. We'll be live-tweeting from the briefing — follow us here. 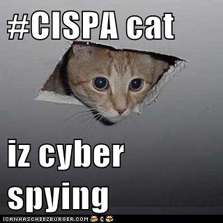 Our goal this week is to show exactly how invasive CISPA's power would be and we encourage all of you to get involved. Please stand with us, tweet with us and tell your Representatives that if cybersecurity legislation doesn't protect your rights, it shouldn't get passed. Learn more about cybersecurity: Sign up for breaking news alerts, follow us on Twitter, and like us on Facebook.